Install a left turn lane on eastbound and westbound KY 20 (Petersburg Road) at Aviation Boulevard. Widening the roadway to accommodate the turn lanes may also require installation of a new traffic signal. 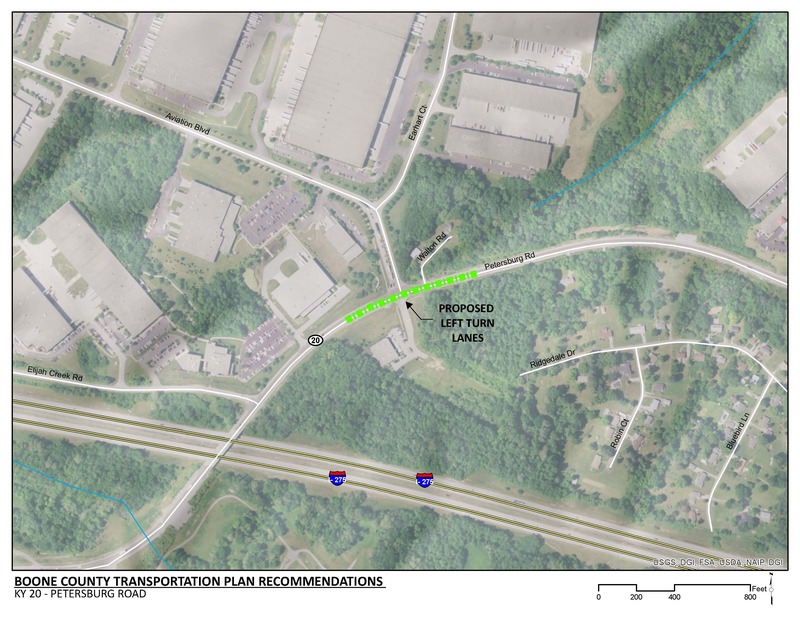 Improve capacity and safety at on KY 20 (Petersburg Road) at Aviation Boulevard. Widening for turn lanes may impact the existing traffic signal and bus shelter at the intersection. The project will require additional right-of-way. Existing KY 20 is a two lane roadway. Each approach to the intersection consists of one lane each. There is a heavy left turn volume from eastbound KY 20 to Aviation Boulevard in the AM peak hours. Left turning traffic blocks through traffic on KY 20. KY 20 within the vicinity of Aviation Boulevard connects Hebron, the Cincinnati/Northern Kentucky International Airport (CVG), I-275, and KY 8. Aviation Boulevard primarily serves industrial land uses, including distribution centers. Field observations indicated that when through vehicles on eastbound KY 20 were stopped for left turning vehicles, vehicles often use the shoulder to pass the left turning vehicle. This can cause a safety issue when through vehicles on the shoulder conflict with unexpecting right-turning traffic from the northbound approach and bicycle/pedestrian traffic on the shoulder. The wide shoulder along KY 20 is considered to be part of the CVG Loop Trail. There is an existing TANK shelter located on the south-west quadrant of the intersection.